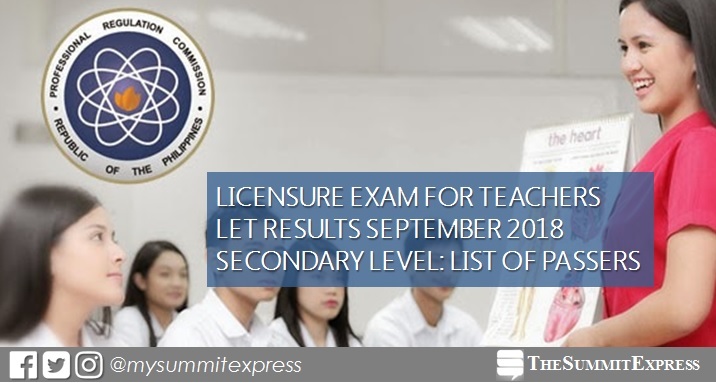 MANILA, Philippines – (Updated December 7) The Professional Regulation Commission (PRC) announces the alphabetical list of passers of September 2018 Teachers board exam or licensure exam for teachers (LET) - Secondary level on Friday, December 7, 2018, based from the latest update of a reliable source. UPDATE: A total of 60,803 secondary teachers out of 126,582 examinees (48.03%) passed the exams. It is further announced that 52,453 passers are first timers and 8,350 are repeaters. The full list of passers or those who have successfully passed the tests will be posted on this page. Below list be activated once LET results are announced online. PRC conducted the LET board exam on September 30, 2018 in at least 25 testing centers throughout the country: Baguio, Bacolod, Cagayan de Oro (CDO), Catarman (Northern Samar), Cebu, Davao, General Santos, Iloilo, Laoag, Legaspi, Lucena, Manila, Rosales (Pangasinan), Tacloban, Tuguegarao, Pagadian, Zamboanga, Occidental Mindoro, Oriental Mindoro, Romblon, Kidapawan, Boac, Palawan and Masbate City. Based from PRC Resolution No. 2017-1068, the target release of September 2018 LET results is on Tuesday, December 4 or in 44 working days after the test. Note that results may be released ahead or beyond the target without prior notice. In the same period last year, results were released in 43 working days after the exam. A total of 49,626 secondary teachers out of 107,020 (46.37%) successfully hurdled the exams. Meanwhile, results of September 2016 were announced after 48 working days. PRC named 31,334 out of 92,754 (33.78%) secondary teachers who passed the tests. Review center owner Dr. Carl Balita hinted on November 11 that the 'big day' for aspiring teachers will happen this month. "NOVEMBER is the MONTH that the Lord has made. LET us rejoice.... who will be LPTs soon?," Balita said. November 18, 2018 Update: Latest information from Balita claims that LET results will be released in December. "...got reliably informed na tatawid sa LAST month ang LET results." November 29, 2018 Update: LET results are expected to be released early December. December 5, 2018 Update: Source says LET results are out late this week (December 6-7). December 6, 2018 Update: Tomorrow is the big day! LET results are expected to be released on Friday, December 7, according to a reliable source. December 7, 2018 Update: LET results are out today! Good luck to all aspiring teachers! Share the good news to other takers!